Authors such as George O’Connor and Tracy Barrett are looking back to the original sources of ancient myth to create fantastic retellings of legendary tales. 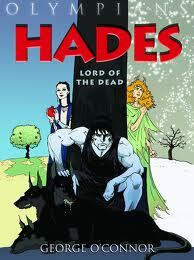 Their books are great reading for teens who are already familiar with and fond of Greek mythology. George O’Connor has created the exciting Olympians series of graphic novels. His four books, Zeus - King of the Gods, Athena - Grey-eyed Goddess, The Glory of Hera, and Hades - Lord of the Dead, published by First Second, are spirited, well-researched interpretations of classic Greek myths in comic book form. 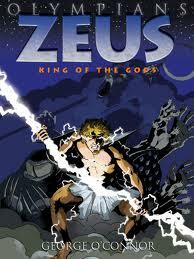 Zeus - King of the Gods tells the creation story in which the titans and the gods battle for supremacy. O’Connor’s illustrations convey the power and intensity of this epic clash, and his narrative gives the gods flesh and bone as they struggle like superheroes and tease like siblings. All four volumes of O’Connor’s mighty tapestry are freshly appealing to young adult readers. His panels reverberate with passion and fury. O’Connor handles the wanton nature of his characters with delicacy so that alert parents have nothing to fear. At the back of each book, the author’s note is like a mini conversation with O’Connor, and the bibliography and geek notes offer a wonderful opportunity for further learning. This series gets my bookmark because it is intelligent, action-packed and a lot of fun. I’m looking forward to future volumes in the series and am hoping that O’Connor makes good on his proposal for a spin-off series of heroes and monsters. Tracy Barrett is a professor at Vanderbilt University and has authored a number of books for young adult readers including Anna of Byzantium, and The Sherlock Files mysteries. Barrett’s recent novels seek to recreate the ancient world while adding a new dimension to familiar characters from mythology. 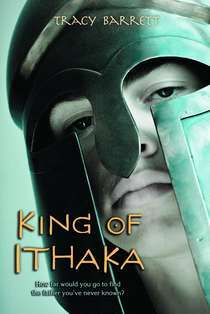 King of Ithaka (Henry Holt, 2010) is Barrett’s imaginative exploration of the personality of Telemachos, son of Odysseus. Accompanied by his friends Brax and Polydora, Telemachos must go in search of his father and then "return to the place that is not, on the day that is not, bearing the thing that is not.” The struggles ensuing from this strange quest help Telemachos grow in the knowledge of what it takes to be a king. 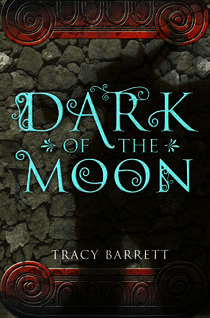 Barrett’s most recent novel is Dark of the Moon (Harcourt, 2011), a very clever re-imagining of the myth of Theseus and the Minotaur. The story is told mostly from the point of view of Ariadne, a young woman about to become the moon goddess of Krete. Ariadne’s misshapen brother Asterion is the captive Minotaur monster to whom Theseus will be sacrificed. I don’t think it’s true that people are people; that we’re all the same no matter where or when we live. If that were the case, there would be no such science as anthropology or sociology! But I do believe there are some constants. At the beginning of “King of Ithaka,” for example, Penelope has to find Telemachos’ shoes for him. Ask any mother of a teenager, and she’ll tell you that boys have shoe-blindness. I bet that was true in the Iron Age as well! I also think that teenagers have always and will always flirt, feel caught between childhood and adulthood, be easily embarrassed, simultaneously crave and fear adventure. I really enjoy exploring these familiar emotions in an unfamiliar setting. The most important reason is that the classics are wonderful stories. They wouldn’t have come down to us if they weren’t. For any ancient tale to have survived is miraculous—someone had to love it enough to write it down (both the Iliad and the Odyssey were originally told orally), and then it had to be copied over and over again in order to survive thousands of years. Paper and parchment were expensive, so they were reused and repurposed if what was written on them wasn’t considered important enough to save (some important ancient writings were reused as mummy wrappings in Egypt!). 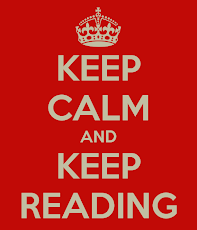 If a book wasn’t loved and taken care of, it would rot or fall apart or be eaten by bugs. So lots of people had to have loved these stories in order for them to make it to the twenty-first century. They can’t all be mistaken. Tracy Barrett had a lot more to say about studying the classics, her writing, and these stories. I thoroughly enjoyed our conversation and I learned a lot. Please read the full interview on my March 2012 blog post. M.D. Clark reads Greek, Norse and Irish myths to her children.